Since the earliest IBM PC computers, consumers have had the option of putting together their own computer system from compatible components. This was what was often referred to as the clone market. In the earliest days, this offered significant savings for consumers who were willing to buy third party parts from smaller manufacturers. Things have changed a lot since then, but there are still significant advantages to building a machine from parts rather than buying a pre-built system. All computer systems sold on the market are a collection of components that provide a functional computing system. Processors, memory, and drives are just some of the parts that make up a computer and allow us to differentiate one system from another. As such, the performance and quality of a system are determined by the parts used in its construction. So what is the difference between a store bought the system and a custom built machine from parts? There could be almost no difference to a very significant difference based on the parts selected for the machine. With this in mind, let's examine some of the advantages and disadvantages of building a computer from parts rather than buying one. The most distinguishing advantage to building a computer from scratch is the selection of parts. Most computer systems come pre-built with the specifications and components already selected for you. This often can lead to consumers having to make compromises on features as they probably won't have all that you want or may offer a subpar component. By building a computer from components, the user is able to choose the parts that best match the computer system they desire. Some vendors do allow you to customize a computer system, but you are still limited to their selection of parts. Another thing that users may not be aware of with pre-built systems is that two of the exact same model computer can actually have very different parts. The reason for this has to do with suppliers, parts available at the time the system was built and just pure luck. For example, Dell might switch between multiple suppliers of memory because one is less expensive than the other. Similarly, they may swap out hard drive brands if one has particular supply problems. Buying all the parts on your own guarantees what parts you will get on your PC. One of the less tangible advantages to building a computer from scratch is knowledge. By building a computer from scratch, a user is able to learn and understand how the parts work together. This information becomes immensely valuable when troubleshooting computer problems. The knowledge of what components control the different sub-systems of a computer means users can repair their own hardware problems without having to deal with support groups or expensive repair bills. Finally, there is the cost. The more powerful your intended desktop computer will be, the more likely you will be able to save money by building your own. This is because many of the premium components tend to carry high markups by the manufacturers as a means to boost profits. While many of the small companies that build high-end systems may build a PC from the exact parts that you want, they have to mark up the price in order to cover their costs for building it and supplier support after the purchase. The biggest disadvantage with building a computer is the lack of anyone support organization you will be dealing with. Since each component can and likely will come from a different manufacturer and/or store means that if a part has a problem, you will have to deal with the appropriate company. With pre-built systems, you only have to deal with the manufacturer and their warranty service groups. Of course, this can also be an advantage in terms of building it yourself as a part failure is often quickly and easily resolved by replacing the part yourself rather than having to wait for a large company to get around to having a tech sent out or the system shipped back to them. Picking out the parts to build a computer system from can be an extremely frustrating process. This is particularly true if you are not familiar with the technology and are building your first computer. You have to worry about sizes, compatible components, wattages, etc. If you don't research things properly, you could end up with parts that don't work well together or maybe won't even fit into the case that you have selected. There are plenty of guides out there to help you including my guides for a $500 desktop build and a low-cost PC gaming system to help narrow down your search. While cost is mentioned as an advantage above, it can also be a disadvantage. This is particularly true if you are looking to build just a basic desktop computer system. Manufacturers are able to get discounts because they buy things in bulk. In addition to this, the budget market is extremely competitive which means it is often cheaper to buy a basic computer for just browsing the web and doing productivity software than it is to build one yourself. Mind you, the cost savings are probably not going to be huge. Probably on the order of maybe $50 to $100. Conversely, you can save hundreds over buying a PC if you are looking at a high-performance desktop PC. Of course, the low-cost prebuilt systems can also leave much to be desired in the quality department. Now that all of that is out in the open, those interested in building their own desktop computer from parts can take the next steps. If you happen to have a Kindle-compatible device, you can also get a copy of my Build Your Own Desktop PC ebook and use this as an offline reference when building a computer. It also goes over some of the aspects of troubleshooting and software installation that are not covered in the e-mail course. Previously users did not have the ability to build their own notebook computers. Even this is changing these days. Several companies now sell base systems that are referred to as ​White Box Notebooks. These have the base components such as chassis, screen, and motherboard already installed. Users can then select items such as memory, drives, processors and sometimes graphics to finalize their own laptop computer. In fact, these basic laptop chassis are often sold to PC companies to then badge as their own systems after finishing off the component installations. If you are determined to build your own PC from parts, make sure to do the research on your parts. There is a wide range of components available for consumers to choose from. It is not possible for sites like the PC Hardware / Reviews to look at every single one of these. 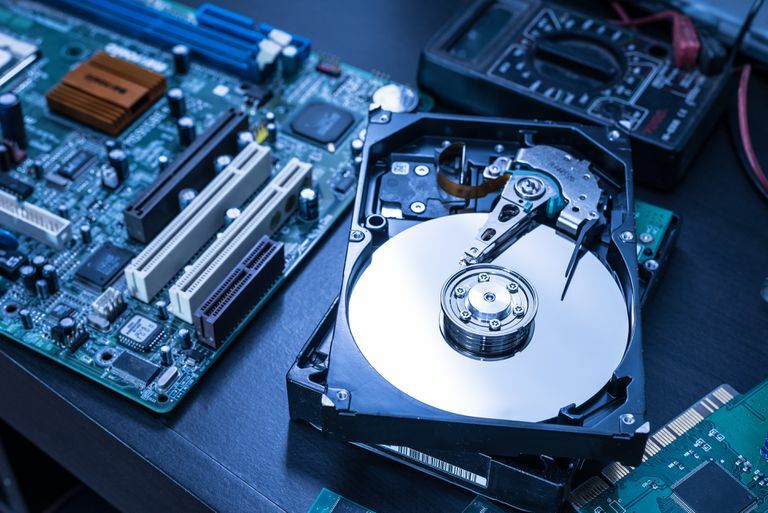 These lists of items such as desktop CPUs, hard drives, solid state drives, DVDs, Blu-ray, and video cards are a good starting point.